Robert Martin Culp, 79, a prolific American actor, Emmy-award winning writer and director passed away this week. His death has an eerie connection to an anniversary. The quintessential tough-guy, Culp's big break came in 1965 when he, along with Bill Cosby, starred in the secret agent show I, Spy. The show broke the color barrier on television and made them household names. Not only did he star in the show, but he wrote the pilot and directed several episodes. 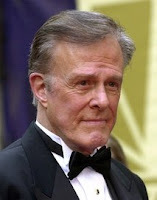 Mr. Culp also appeared in several episodes of The Outer Limits, the video game Half-Life 2 and was almost the lead in the series Space: 1999. I remember him co-starring in the The Greatest American Hero as FBI Agent Bill Maxwell. The show's premise was that a high-school teacher gets an alien suit that gives him superpowers. Maxwell's job was to keep the guy from killing himself or hanging up the cape for good. The eerie connection? His death comes less than one week after the anniversary of the first airing of the show on March 18, 1981. The guy was a class act, and had a great sense of humor. In 2007, he reprized his role of Bill Maxwell for a skit on the stop-motion animation show Robot Chicken. He also appeared as a regular on the comedy series Everybody Loves Raymond. Happy Trails Mr. Robert Culp. Thanks for the memories. You can share your thoughts on Robert Culp in the comments. That was a sad thing to hear. Robert Culp dead? He was a real man's man.